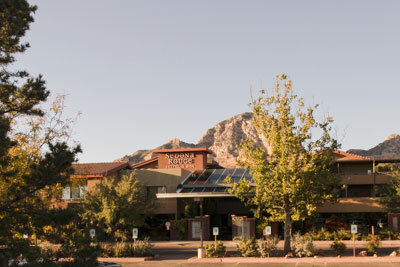 Located just down the road from Tlaquepaque, along Sedona’s main drag, Sedona Rouge (928-203-4111, www.sedonarouge.com) is far from a mainstream pedestrian lodging choice. Very far. As principal Jim Apple puts it, “Sedona Rough is a romantic getaway and a sophisticated private retreat.” And you notice that sophistication and sense of style from the moment you enter the lobby. This 74-room property is an eclectic mix of ancient Roman, French, Mediterranean and North African cultures; featuring Tunisian wrought iron window work and an interesting mix of Moroccan and Moorish interior decor. Couple that with a collection of top-drawer amenities and a very accommodating staff, and you have all the ingredients for a perfectly relaxing retreat. Access hasn’t been overlooked at Sedona Rouge either, with plenty of accessible parking in front, and level access to the courtyard entrance and front lobby. There’s also a drop-off zone in front, if you can’t manage the walk from the parking area. From the lobby, there’s elevator access up to accessible Room 213, which overlooks the water feature in the first-floor courtyard. This corner room features wide doorways and good pathway access, and is furnished with two 29-inch high queen-sized pillow top beds. Other furniture includes a chair, an ottoman and a desk. There’s also level access out to a small balcony, but because of its size and placement it’s a little crowded for a wheelchair. Still, it’s very pleasant to open the sliding doors and let the breeze flow through. The oversized bathroom has a large roll-in shower with grab bars, a shower chair and a hand-held showerhead. There is also an overhead rain shower, with the controls located within easy reach while seated. The shower measures a whopping 78 inches by 54 inches, and includes a four-foot opening. And it’s not like they took the room out of the rest of the bathroom either, as it still boasts a very healthy five-foot turning radius. Other access features include toilet grab bars on the left and back walls (as seated), a roll-under sink, and a lowered make-up mirror. There is also level access to Reds restaurant, which is located right off the lobby. The menu features a large selection of comfort food, presented in a gourmet fashion. Whether it’s a small plate of scallop tacos, a light salad or a more substantial entree such as a spinach and mushroom stuffed chicken breast, there’s something for just about every taste. And don’t forget to stop by for breakfast, as they serve up a mean plate of huevos rancheros. It’s also a great spot for a relaxing cocktail after a long day of sightseeing. In short, everything about this property is relaxing. Indeed, it’s the perfect place to unwind and soak in in the spiritual energy that simply engulfs Sedona.